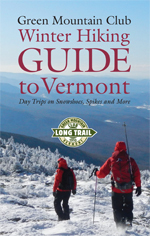 Winter Hiking Guide to Vermont, by the Green Mountain Club, 2013. Compact guide provides detailed maps and trail descriptions for more than 75 winter day hikes across Vermont. For each hike there are trailhead directions, a color topographic map, and hike description. Includes a variety of mountains small and tall as well as ponds, waterfalls and other destinations. Includes winter hiking and safety tips and a list of "Short and Sweet" hikes that are around a mile or less. 326 pp, 4 1/4" X 6 1/2."